"Rich" and "granular" patient data from hospital and GP records could be shared with policymakers and researchers under new plans from NHS Digital. Campaigners have criticised the move, which would see far more detailed information shared higher up Britain's health and social care food chain, warning it has echoes of the scrapped Care.data scheme. They also claimed that the changes, outlined in a consultation opened for responses in February and due to close at the end of the month, have been "buried" and won't have received enough scrutiny. The consultation on the Clinical Information Standard Specification is linked to health secretary Matt Hancock's "tech vision". NHS Digital said the aim was to set out "what better, standardised coding could allow us to achieve in the future". Standardising the disparate coding systems in the NHS could improve patient care and population health, reduce the risk of harm related to information errors, boost R&D, and help direct funding, the document said. 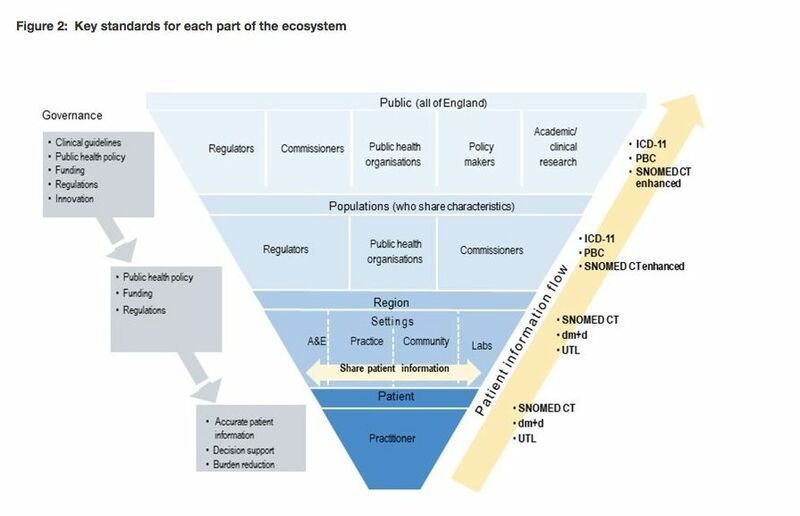 However, the move would mean recording unprecedented levels of detailed patient information centrally and possibly sharing raw data with researchers or policymakers – this flow is set out in a diagram in the consultation document. The broad aim is to create an "end-to-end flow of patient information" with a "significant focus" in the medium term being to provide "increased granularity to secondary uses flows", such as commissioning, funding, policymaking and research. This will involve developing a national system that will "begin to transition toward landing raw... data rather than post-transformed data". At its heart is a push for widespread adoption of SNOMED, a coding system used by clinicians to record symptoms, family history, observations, diagnoses and more. It is already used in primary care. Secondary care, community systems and dental care are required to implement it by 1 April 2020. The prospect that this "rich clinical detail", as NHS Digital describes it, would be shared with researchers or policymakers has put the wind up campaigners. Concerns are heightened because previous efforts to centralise health information and increase data-sharing have not met with great success. "The plan for Care.data involved taking GP data and using it for decision-making much more widely. This is that," said Phil Booth, coordinator at MedConfidential. "This isn't about giving better statistics to policymakers, this says there will be a flow of patient information up to the policymaker – that goes beyond explaining a trend, and talks about sharing raw, clinical data." A further concern is that the consultation is hosted on an obscure webpage, which dates back to when NHS Digital was known as the Health and Social Care Information Centre. "This is a massive change, and it's being done in an opaque way through a consultation that is buried in the basement of a consultation that they haven't really promoted," said Booth. "Using patient information for funding decisions by policymakers is just toxic, and they know that." The first part of the proposed work would be to embed the standards and ensure systems are interoperable, including modifying national systems so information can be received and processed centrally. After that, the focus will shift to "increasing the value that the health and care system can extract from having SNOMED CT coded patient-level data", and "using levers" for system suppliers to natively embed SNOMED in their systems. The third phase will be to demonstrate the value of the patient information flows. NHS Digital said in a statement to The Register that it had committed to ensuring that sensitive data collections would be pseudonymised at source before collection. "We have also made clear that the data... will not be stored as one dataset. It will only be linked as needed, for a specific, pre-agreed purpose with a clear legal basis for the linkage and dissemination," a spokeswoman said. "This will help us to better support researchers with more granular data, whilst protecting patient information." She added that the standards are not yet final and had been available through a various sets of consultation documents since October.